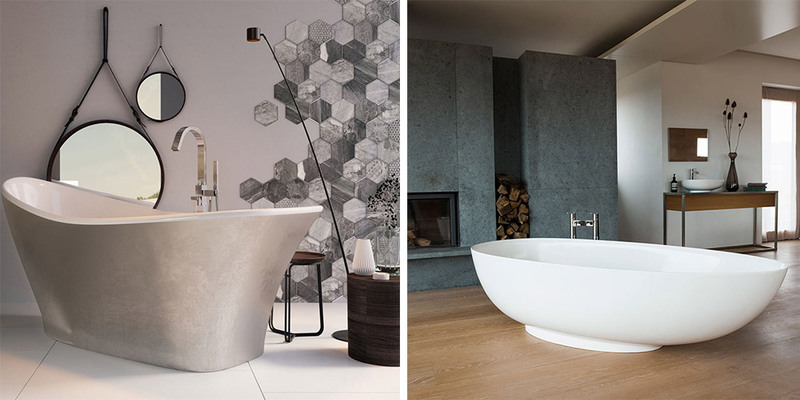 Another year and another set of bathroom design trends guaranteed to wow visitors to your home. 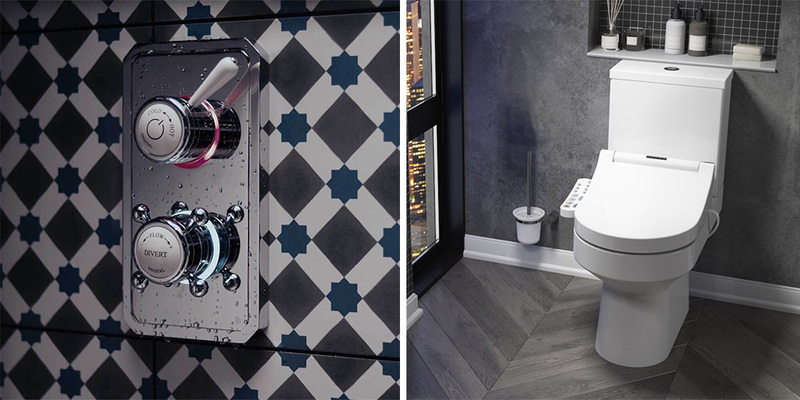 From fashionable fixtures to 2018’s most contemporary colours, we’ve got all the inside knowledge when it comes to the top bathroom design trends of 2018. Right, let’s get started! 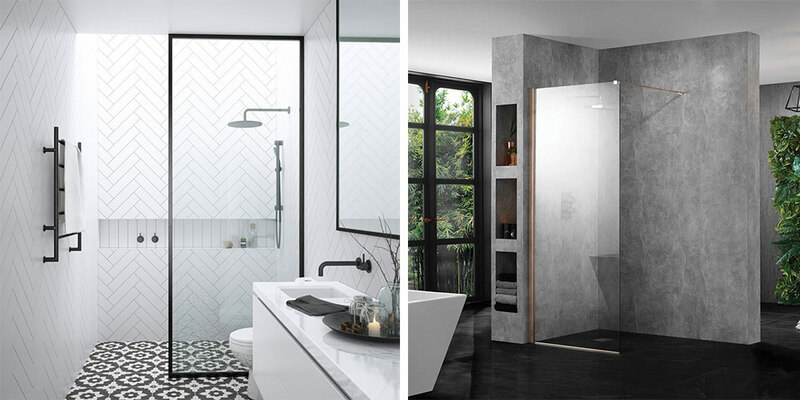 Ensure your bathroom is the talk of the town with our top bathroom design trends of 2018. Decorating your bathroom with metallic finish features is the perfect way to ensure you stay bang on trend in 2018. But you don’t have to go all out with rose gold everything to fly the boutique flag this year. 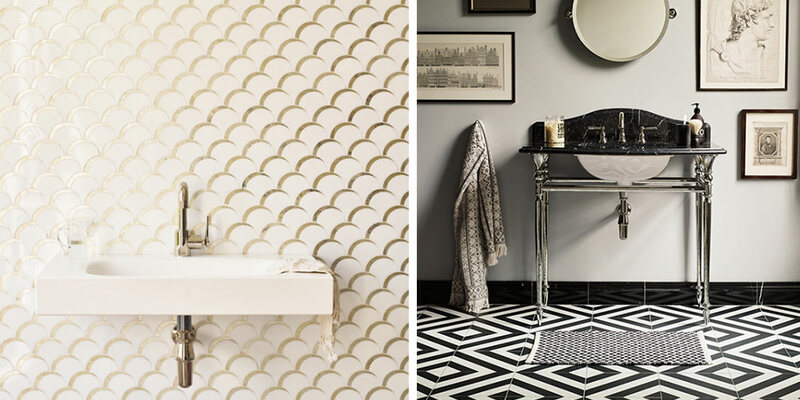 Small metallic accents can add a real luxurious feel to an otherwise understated bathroom. It’s important not to go too overboard with different metal finishes though. Consider complementary gold basin and bath taps as a lavish feature for the room, or perhaps antique brass bathroom taps to give it a classic style and feel. Alas, we are not all blessed with the luxury of a spacious bathroom but with compact furniture rising in popularity at the rate it is, a lack of space is no excuse for not having a beautiful bathroom! Cloakroom vanity units are high up on our list of bathroom design trends to watch out for, and the more compact the better! Not only do cloakroom vanity suites look pretty darn great, they are also reliable space savers and can turn a busy bathroom into a clutter-free haven to relax in. 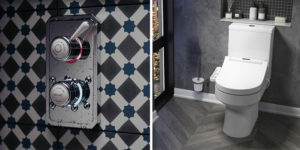 If the most-high tech item you have in your bathroom is an automatic air freshener, then you may feel a little sceptical when it comes to the sheer number of remote-control goodies you can now install in your bathroom. From remote control toilets to digital showers to electric toilet seats, we can see why you might be dubious. We can assure you however, investing in some high-tech bathroom fixtures is totally worth it, not only for comfort but also for the practicality and ease of use. 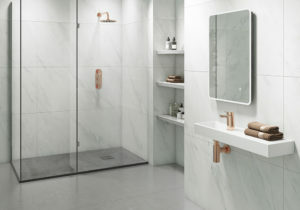 If you want to get connected shower-style, check out Crosswater Digital at one of our showrooms. It includes a digital thermistor to check the temperature of the water 10 times every second, colour changing displays to show the desired temperature and a self-cleaning mode. A separate remote control will turn the shower on from up to 10 metres away. Plus, it’s got all the wonderful features of your usual shower including suitability for high or low pressure, and a 5-year manufacturer guarantee. What’s not to love? Smart toilets. the kind you’ve seen in Japan that seemingly have a cleaning spray for every part of your body, are becoming increasingly popular in the UK too. These self-cleaning WCs are packed full of the latest toilet technology to make the entire experience as pleasant and fragrant as possible. They might not have taken off for the mainstream here just yet due to the relatively expensive costs, but they are certain to become the household norm within the next few years. A countertop basin is one of our favourite ways to add a little class to any bathroom interior in 2018. Unique, elegant and minimalist, countertop basins can be styled up in any way you want – be it classy and contemporary or beautifully boutique. One of the best things about countertop basins is that they can be integrated into any bathroom, no matter how much space you have available. Pair an oval countertop basin with a modern vanity unit for a sleek, contemporary feel, or embrace the elements with a stone countertop basin and a whole load of indoor plants. Whichever way you style it, we’re sure you won’t be short of bathroom compliments in 2018. In our hard-work, high-stress culture, it’s safe to say that quality time with our loved one is no longer top of the agenda. In 2018, that looks set to change. Tubs for two are helping couples kill two birds with one stone – bathing and spending time together! Alright, so it doesn’t sound particularly romantic when we put it like that, but if you’re craving that quality time (or just a really big bath) then perhaps a tub for two should be on your shopping list. We all know and love the freestanding bath. 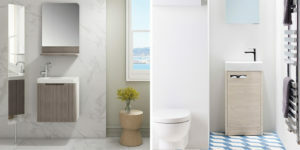 It’s an instant way to update your bathroom, and add either a vintage or modern touch depending on the design you go for. Our large freestanding baths not only make a fierce fashion statement when it comes to bathroom design, they also provide a comfortable place for you to relax and escape the stresses of everyday life – presence of loved one optional! Moroccan or beautifully patterned tiles always look wonderful in bathrooms. When paired with the right fixtures or an eye-catching indoor plant, you can turn your bathroom into a boutique haven that wouldn’t look out of place in Casablanca itself. 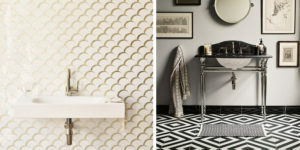 Whichever way you decide to decorate, patterned tiles is a bathroom trend we hope never goes away. Frameless or walk-in shower enclosures have seen a huge rise in popularity in recent years, mostly thanks to their unique ability to make your bathroom and shower appear a lot bigger and a lot more contemporary than it actually is! 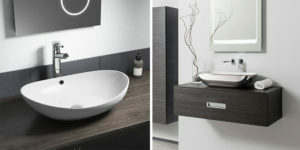 They also add a minimalist and elegant feel to any bathroom, a fashion we don’t see going anywhere any time soon! Walk-in shower enclosures look fantastic when paired with a trendy glass panel and we think we’ve got just the thing. Our Roman shower screens are stylish, easy to maintain and looks perfectly at home in a modern, 2018 bathroom. For something equally trendy, check out industrial framed showers. Our Roman Matt black frame adds a sophisticated and sleek feel to your bathroom and looks fantastic when paired with other black and white fixtures. For extra style points, watch this space for our metallic frames launching very soon to give your bathroom that ever-sophisticated antique pop of colour. Our final bathroom design trend to watch out of in 2018 is the use of dark and sumptuous tones. While light and neutral is still very much in fashion, if you’ve got a little more space to work with then using darker tones could be the touch of glamour your bathroom interior is crying out for. 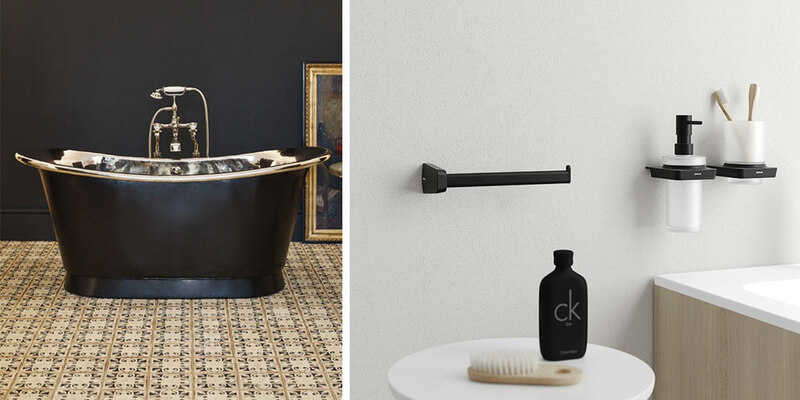 While kitting out your entire bathroom in black may be slightly too much of a good thing, just a small cluster of darker grey bathroom tiles or some moody paint goes a long way towards adding a touch of class, as well as little bit of drama, to your bathroom. We love the combination of dark tiles with white ceramics and furniture. If you don’t want to go all out, a feature wall will jazz up any bathroom and is bound to turn heads. Proceed with caution if you don’t have a huge amount of space in your bathroom, just a few matt black accessories here and there will go a long way! But that’s not all. Whilst previous years’ have seen us trawling through magazines trying to find our dream bathroom interior, 2018 is the year for realising your dream bathroom using 3D design. Simply measure your bathroom dimensions, pick out some of your favourite pieces and we will send you a 3D design of your dream space – tailored to fit the size, shape and feel you’re going for. Check out our free consultation and start building your perfect bathroom!